In my neverending quest to track The Popularity of Data Science Software, it’s time to update the section on Scholarly Articles. The rapid growth of R could not go on forever and, as you’ll see below, its use actually declined over the last year. Another interesting comparison on Figure 2b is JASP and jamovi. Both are open-source tools that focus on statistics rather than machine learning or artificial intelligence. They both use graphical user interfaces (GUIs) in a style that is similar to SPSS. Both also use R behind the scenes to do their calculations. JASP emphasizes Bayesian Analysis and hides its R code; jamovi has a more frequentist orientation, it lets you see its R code, and it lets you execute your own R code directly from within it. JASP currently has nine times as many citations here, though jamovi’s use is growing much more rapidly. While Figures 2d and 2e show the historical trend that ended in 2016, Figure 2f shows a fresh set of data collected in March, 2019. Since Google’s algorithm changes, preventing the new data from matching exactly with the old, this new data starts at 2015 so the two sets overlap. 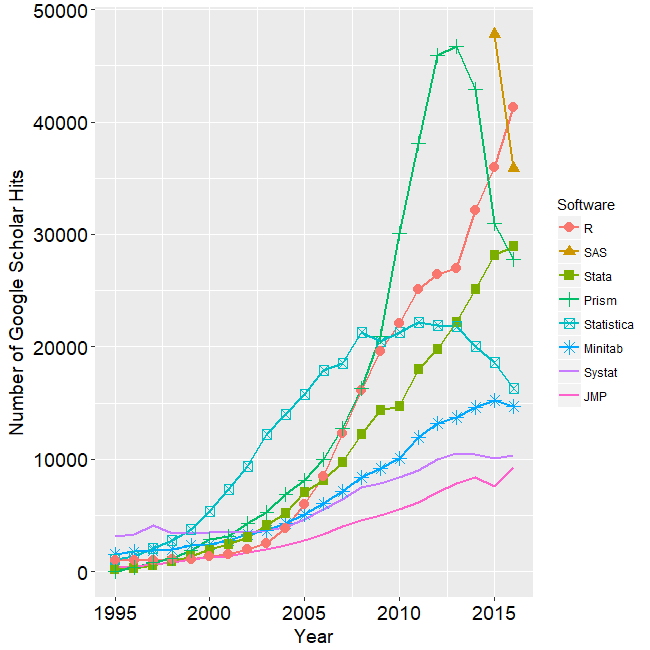 SPSS is not shown on this graph because its dominance would compress the y-axis, making trends in the others harder to see. However, keep in mind that despite SPSS’ 39% drop from 2017 to 2018, its use is still 66% higher than R’s in 2018! Apparently people are willing to pay for ease of use. 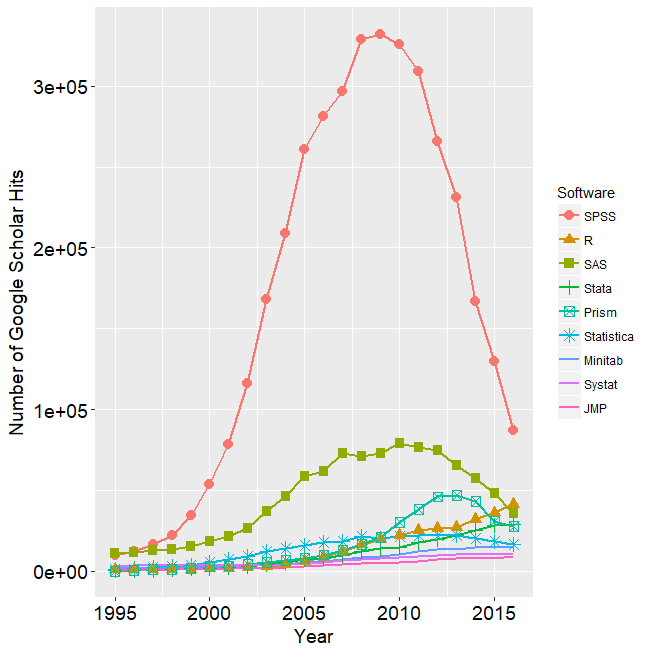 To see many other ways to estimate the market share of this type of software, see my ongoing article, The Popularity of Data Science Software. My next post will update the job advertisements that list science software. You may also be interested in my in-depth reviews of point-and-click user interfaces to R. I invite you to subscribe to my blog or follow me on twitter where I announce new posts. Happy computing! This entry was posted in Analytics, Data Science, Python, R, SAS, SPSS, Stata, Statistics, Uncategorized. Bookmark the permalink. Thanks for this valuable information! I am a data scientist in academia, and see these patterns roughly at my institution. The exception is I haven’t encountered anyone using SPSS. I wonder if the conclusions change if you look at market share through time rather than the 2015, 2018 comp %. If normalizing by total number of hits for all packages, does R continue to rise? This may also be less vulnerable to changes in the search algorithm. The lack of SPSS usage among your colleagues isn’t too surprising if they’re all data scientists. We see most of our SPSS use among scientists that only occasionally analyze data. That occasional use makes learning a language difficult. Regarding the plots of counts, if I take the raw counts for each package and divide them by the total hits for all packages, then I’ll have the plot in a form of % of hits. Is that what you mean? If so, the shape of the plot won’t change, since everything is being divided by a constant. Only the labels on the y-axis will change. Or am I misunderstanding you? Really interesting! However, you have to take this with a grain of salt. There is a lot of usage outside of academia that isn’t published, and I would argue that often firms do work for several years before they decide to publish it… so scholarly papers may not be the most leading indicator. Also, pricing models for academic use are often much more favorable, so I think you have to be careful assuming that use in scholarly papers equates to willingness to pay premium for convenience.